Greeley City Hall is located at 1000 10th Street, Greeley, CO 80631; phone: 970-350-9741. Photo: Glazier House, ca. 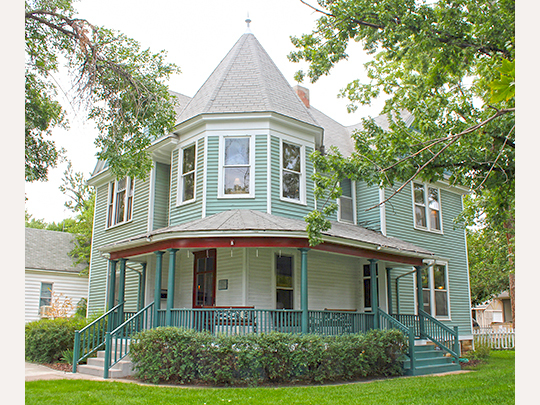 1912, 1043 10th Avenue, Greeley, CO. Listed on the National Register of Historic Places in 1991. Photographed by User:Jeffrey Beall (own work), 2012, [cc-by-3.0 (creativecommons.org/licenses/by/3.0)], via Wikimedia Commons, accessed February, 2016. The Greeley Daily Tribune was first published in 1870, the same year the town of Greeley was founded, inextricably linking the newspaper's and the town's beginnings. The Greeley Daily Tribune was established by New York editor Nathan Meeker, who also founded the town. Meeker was born to an affluent family in Ohio in 1817 and graduated from Oberlin College in 1840. Then as now, Oberlin was a place friendly to radical ideas, and Meeker became intrigued with the Utopian plans advocated by the French philosopher Francois Fourier. In 1844, he joined the "Trumbull Phalanx" in Ohio. The "Trumbull Phalanx" was an agricultural co-operative community based on Fourier's concepts. He remained at the "Trumbull Phalanx" into the 1850s. Moving to New York in 1865, Meeker became the agricultural editor of the New York Tribune. In his columns, Meeker championed the idea of establishing agricultural co-operatives in the American West. In 1869, Meeker, with the support of his boss, Horace Greeley, the editor-in-chief of the widely read New York daily newspaper, announced plans to start a co-operative in the Colorado Territory. The group, called the Union Colony, was organized at a meeting at New York's Cooper Institute. Meeker offered membership in the Union Colony "for sale to temperance men of good character." In 1870, the Union Colony group came to the banks of the Cache la Poudre River and set up the town, naming it Greeley in honor of Meeker's former boss and mentor. On arriving at the settlement Meeker immediately built an adobe house for himself and his wife and daughter. The Meeker Home, a simple adobe Italianate style residence, still stands at 1324 9th Avenue near downtown Greeley. It has been a house museum since 1929 and is listed on the National Register of Historic Places. Meeker founded a number of Greeley institutions that first year including opening a post office, establishing a museum, and not surprising, considering his career as a newspaperman, a newspaper. The Greeley Daily Tribune was named after the New York Tribune. The script style used for the typeface of the title of the Greeley Daily Tribune was designed by Greeley himself. It was modeled after the typeface used for the New York Tribune. The Greeley Daily Tribune still uses this Greeley-designed typeface for its title today. Betsy Kellums, Historic Preservation Specialist, City of Greeley, Greeley Tribune Building, Weld County, Colorado, nomination document, 2006, National Park Service, National Register of Historic Places, Washington, D.C.